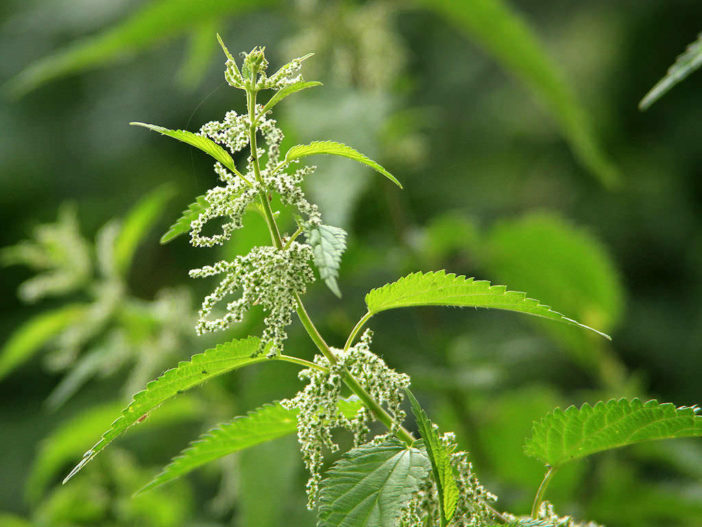 In medieval Europe, Urtica dioica (commonly known as Stinging Nettle), was used as a diuretic (to rid the body of excess water) and to treat joint pain. Stinging Nettle has been used for hundreds of years to treat painful muscles and joints, eczema, arthritis, gout, and anemia. Today, many people use it to treat urinary problems during the early stages of an enlarged prostate, for urinary tract infections, for hay fever, or in compresses or creams for treating joint pain, sprains and strains, tendonitis, and insect bites. Stinging Nettle is an herbaceous, quick-growing plant whose leaves and stems are covered with tiny, hollow, silica-tipped hairs which can cause irritation. Can grow to a height of approximately 4 feet (1.2 m). Stinging Nettles prefers rich soil with good moisture content and especially favors the edges of streams or nutrient-dense pastures. Stinging Nettle seeds are tiny, light dependant germinators that can be started indoors or out. However, select your location carefully as Nettles are very hardy and can spread quickly with the right conditions. Stinging Nettle can be assisted with stratification, but it is not necessary. To start, tamp the small seeds lightly into the soil or cover with a thin layer of soil (0.25 inch/6 mm). If starting indoors, sow in flats in late winter and transplant in early spring. Space plants approximately 8 inches (20 cm) apart. If direct sowing, seed in spring and thin as desired and plant rows 1 inch (2.5 cm) apart. It recommended to find a permanent spot with rich, moist conditions a little away from (or on the periphery of) your other herbs. Carefully collect spiny leaves before plant flowers in spring and early summer. Do not harvest when flowering. Be sure to wear gloves when collecting to avoid the ‘sting’ delivered by tiny hairs on the leaves and stem. Place on well-ventilated screen to dry. Stinging Nettles are full of nutrients. They are best used fresh for cooking and should be harvested just before you intend to use them. Cooking neutralizes the plant’s stinging ability. For making tea you can use fresh or dried leaves.